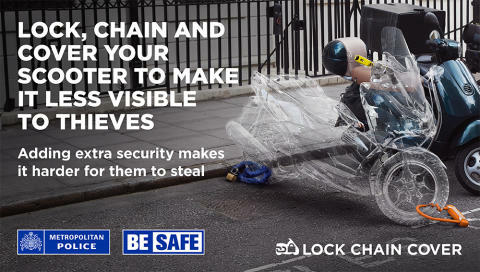 As officers continue their daily work to tackle criminals using stolen mopeds in crime, the Met is launching a campaign to encourage owners of motorcycles, scooters and mopeds to secure their bikes - 'lock, chain, cover', part of the Be Safe campaign. Although the number taken has fallen by nearly 36 per cent, over 9,000 were still stolen in the last year. Chief Inspector Jim Corbett, from Operation Venice which tackles moped and motorcycle crime, said: "Officers from Operation Venice have worked hard to reduce theft over the last year, but we need the help of vehicle owners to drive this down further. "A large number of bikes are still left with no additional security measures in place and only a steering lock to prevent them from being stolen. It only takes seconds for a thief to steal one, if it's unprotected. "Using additional security reduces the chances of your bike being stolen, which is reduced even further if multiple measures are used. We're asking owners to assist us by layering security - lock, chain and cover your bike. "Thieves often 'shop for models' and look for the easiest bikes to steal. If your bike is covered, it's less likely to draw the attention of thieves." 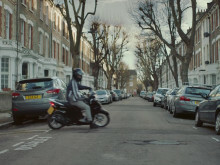 The 'Be Safe' campaign supports Operation Venice and policing activity across London, with particular focus on the boroughs experiencing the highest amounts of bike theft: Tower Hamlets, Wandsworth, Haringey, Brent, Southwark, Barnet, Greenwich, Hackney, Islington, Camden, Lewisham and City of Westminster. It is supported by the Motorcycle Industry Association and a wide variety of partners across the industry from manufacturers to insurers and training providers. Chief Inspector Corbett added: "Our campaign contains a number of different elements which we hope will remind owners to use security. A video highlighting the risk of theft and online adverts, boosted by key search terms, will help raise awareness. 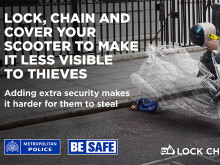 "Our advertising will be seen across London, on buses and on pavement stencils at motorcycle parking bays which have seen high numbers of thefts. We hope these messages will also deliver a reminder to riders when parking their bikes." LOCK: Use a disc lock on the front wheel to stop your bike being wheeled away. Fit a grip lock to the throttle and engage the steering lock. CHAIN: Secure the rear wheel with a chain and a padlock. Attach the chain to a ground anchor or other fixed object where possible. COVER: Bike covers prevent immediate access to the controls and security features and stop thieves shopping for bike models. Lock, Chain, Cover campaign video.